This is the academy which was erected to educate students and to enshrine and worship Park Ik (1332∼1398), a civil officer in the late Goryeo Dynasty, and 14 volunteer soldiers who fought against the Japanese invasion called Imjin Waeran. Park Ik distinguished himself in battles against the Japanese invasion and the Nǚzhēn (Yeojin in Korean) people's invasion. After the foundation of the Joseon Dynasty, he declined a public position and isolated himself, loyal to the preceding Goryeo dynasty. He became the first ancestor of the Park family which originated in Miryang and which accepted Cheongdo as its hometown. father and son, brothers, uncle and nephew, and cousins. It is a very rare case that people of the same family rose to action at the same time and made such achievements. 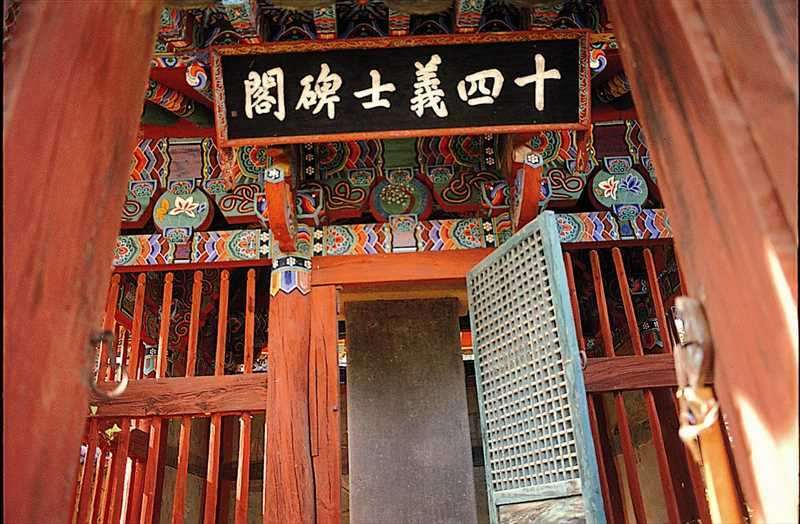 In the grounds of Yonggangseowon Confucian Academy, Chungyeolsa Shirne stands to enshrine those fourteen volunteer soldiers' tablets and worship them, and a shrine monument for them is also found. The monument describes the situation of the Japanese Invasion in detail, and sets a model of patriotism to descendants.